You are at:Home»April»April 28»April 28, 1503: What Was the First Battle Won by Small Arms Fire? April 28, 1503: What Was the First Battle Won by Small Arms Fire? On April 28, 1503, the armies of Spain and France fought in Southern Italy at a place called Cerignola (near Bari), a battle decided by the small arms fire of muskets and arquebuses, one of the first European battles where small arms fire from firearms decided the battle. Although hand held firearms using black powder had been around for nearly 200 years, such weapons had usually not been decisive in battles fought mainly with edged weapons and later with a combination of edged weapons and cannons. Gunpowder is an invention normally credited to the Chinese in the 9th or 10th Century, at first a novelty used for entertainment and fireworks. Whether gunpowder technology reached Europe from China or gunpowder was later also invented in Europe, we know Europeans were familiar with gunpowder (also called black powder) by the 13th Century. Gunpowder may have reached Europe via the Mongol invasions of the 1200’s or via the Silk Road. Crude bamboo hand cannons were devised in China, likely as dangerous to the user as his intended victim! Other forms of gunpowder weapons included tipping spears with bamboo barreled firearms (“fire lance”) where the ignition could take place a safe distance from the person employing the weapon. Around the 13th Century Chinese armorers devised metal barreled hand held weapons (“hand cannons”) using gunpowder, the first practical firearms. Proper artillery cannons appeared in Europe in the 15th Century. The first known reference to a gun in Europe dates from 1322, and the first known picture of a gun in Europe was in a manuscript by Walter de Milemete from 1326. Multi-barreled volley guns and arrow launching guns were also produced in Europe in the 14th Century while arms makers sought the most practical gunpowder weapons. 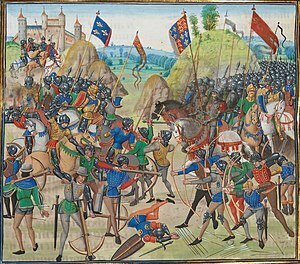 An early European use of cannon was at the Battle of Crécy in 1346. By 1503, hand held firearms and cannons were in common use in Europe, though use of small arms was highly problematic due to weather (rain and mist made them virtually unusable) and the slow rate of reloading. Additionally, small arms were highly inaccurate compared to the fine accuracy of a trained bowman. The main advantage of small arms versus edged weapons and bow and arrows was the ease with which a musketeer could be trained compared to a skilled archer. The early forms of small arms in Europe were the arquebus (a large single person arm with a hook underneath used for steadying the heavy weapon on a rampart, wall, or other barrier) or the musket, another sort of long hand held arm usually fired while supported by a monopod stick with a vee shaped support at the top to lay the barrel in). Ignition was by use of the match lock, a slow burning piece of cord kept smoldering at the ready to fire the weapon. The terms arquebus and musket were sometimes interchangeable, especially as firearms evolved. The wheellock ignition system began appearing around 1500 which gradually replaced the matchlock, and was in turn replaced by improvements such as the snaplock and later (circa 1600) by the flintlock. At Cerignola the Spanish forces numbered only about 6300 men and 20 cannons, but among them were 1000 arquebusiers (soldiers equipped with an arquebus). The Spanish faced the much larger French force of 9000 men and 40 cannons but were able to repel French attacks with massed arquebus fire, cutting down the attacking French. The Spanish gained a huge victory, killing about 2000 of the French to a loss of 500 Spaniards. The arquebus had proven pivotal in the Spanish victory, the first time small arms were known to have proven decisive in a battle of European armies. 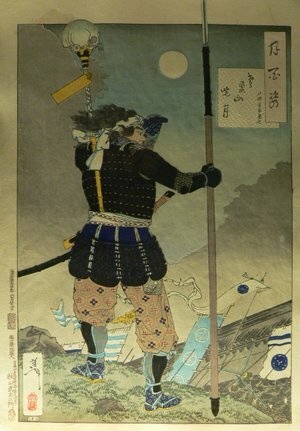 A similar watershed event occurred in Asia at Battle of Nagashino in 1575 when Japanese fought other Japanese using small arms in a decisive manner, considered the first “modern” battle in Asia. The progressive improvements in military and civilian small arms has continued ever since Cerignola and the advent of metallic cartridges, repeating weapons, automatic weapons and smokeless powder have made firearms all the more deadly. Not only have swords, lances, pikes, bows and arrows become obsolete, many modern military rifles and carbines are not even equipped with bayonets anymore, and even when bayonets are supplied to soldiers they are rarely used in their designed role. Do you have a favorite among the antique style firearms? If so, please share your thoughts on those old weapons with us. Or if you prefer, tell us which of the modern small arms you think are the best. Kelly, Jack. Gunpowder: Alchemy, Bombards, and Pyrotechnics : The History of the Explosive That Changed the World. Basic Books, 2005. Spencer, Michael. Early Firearms: 1300-1800. Shire Publications, 2008. Wills, Chuck. The Illustrated History of Guns: From First Firearms to Semiautomatic Weapons. Skyhorse Publishing, 2017.